Virtually all of us are familiar with some of the magnificent nature and wildlife programmes on TV, the likes of which are often synonymous with the programmes made by David Attenborough for the BBC. The documentaries he is involved with can be astounding to watch and seem almost effortless. However, as you’ll probably be aware, filming wildlife in particular is never going to be as straightforward as it appears in a final cut as filming wildlife and nature can be very unpredictable and you can spend painstakingly long hours waiting to capture the ideal scene. Nevertheless, despite of the unpredictability, you’ll still need to create some kind of structure for the film if it’s to be of interest to the viewer. Firstly, you’ll need to determine if you’re creating a short film or adopting a documentary style approach. You may wish to have a presenter on camera or merely use a voiceover and let the images illustrate the most important parts of the film. You might also need to source suitable interviewees if you are creating a documentary. First of all, make sure you have permission to shoot in a particular area first. Filming the spot you think the animal is heading towards first then letting them walk into and out of the shot is a highly effective technique as is the pull focus shot which can really capture drama and create a particular ‘mood’ to your scene. This technique, in particular, helps to place the subject in context and also draws in the audience. Whether you’re going to have a presenter or you’re simply putting a voiceover onto the film later, be sure not to overwhelm the viewer with too much verbal information. Any commentary that is added should really just be there to compliment the visuals of the nature or wildlife concerned but not to take the attention away from it. The most interesting wildlife documentaries are those which focus on the wildlife at play, caring for their young, at feeding time and in times of conflict. Therefore, it’s obviously a good idea to get to learn as much about the type of wildlife you’re going to be filming first, understanding their habits and patterns of behaviour etc. before you set off. 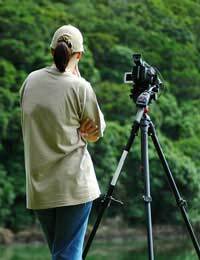 However, even if you have obtained permission to film, you should ask the relevant authority responsible for granting permission if there are any aspects you might need to take into consideration, especially with regard to safety - both your own and that of the wildlife. Remember, when out filming wildlife anywhere, YOU are the guest in THEIR home so respect both the wildlife and the environment in which it inhabits. Don’t be tempted to get up too close, particularly if you’re unfamiliar with wildlife filming. If you get too close, it could cause an animal to abandon its young and, even more dangerous, it could be prompted into attacking you. The weather (as well as the wildlife) can be unpredictable so when filming outdoors be prepared for sudden changes in the weather and make sure that your equipment is kept clean, dry and protected from the elements. It will probably take several attempts and many hours to capture all of the footage you’ll require for your film. Therefore, to create an interesting nature or wildlife video, you should be prepared to be extremely patient. The best wildlife film makers have had years of experience so don’t expect to get it right first time. It may take several attempts to come up with something you’re happy with.